Is your company community minded? Have you ever wondered how you could get involved and make a difference in someone’s life? Would you like to see your company logo on our vehicles, supporting our passengers? DREAMS Transportation Ltd. has an excellent opportunity for you to get involved and help support the special needs community. Your dollars will directly benefit individuals with special needs and senior citizens by helping with their transportation needs. By purchasing a “cloud” on the side or back of our vehicles, you can show your support to individuals with special needs. One cloud represents a seat in a vehicle. Depending on your level of support, you can buy one cloud or many clouds. Provide meaningful employment to those with special needs. We want to provide an opportunity for a real job, with real pay. Provide transportation for many children who have cancers such as leukemia, who are medically fragile, have arthritis and broken bones, and those with Down syndrome, Autism, Cerebral Palsy. Transport more senior citizens to medical appointments, social functions, shopping trips, group outings, out of town trips. We have also taken groups from their lodge to be able to attend funerals of fellow residents. 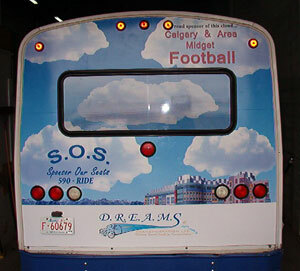 In September 2002 the van doors opened and DREAMS Transportation Ltd. was welcomed into the community. Our philosophy is simple. To the best of our ability and resources we will provide efficient, courteous and compassionate service that recognizes the value of those with special needs in our community. Our Mobility Specialists are well trained and possess superior people skills. So, your name partnered with ours will be represented with excellence in the community. We drive individuals to the Alberta Children’s Hospital, Tom Baker Cancer Clinic, summer camps. Some of our out of town charter service has taken us to Strathmore, Banff, Canmore Kananaskis, Cochrane, Okotoks, Lethbridge, and Edmonton. We are currently transporting 100 daily riders to specialty school programs, driving in all quadrants of the city and covering 1500 kms per day. Your logo will be seen throughout Calgary and Alberta. We believe the most important way we can contribute to the community of special needs, is to work with the resources and talents of the business world to develop a program that will meet and exceed the needs of this population. With your support, we know our “Sponsor Our Seats” program will be a huge success!